Block CRM phonecall on click-to-dial means that the annoying popout that CRM creates when you do a click-to-dial can be blocked. Instead, Dynamics Telephony can silently create a record of the call with all information, including duration, correct. Google phone library support means that click-to-dial and dialer calls are dialed accurately even when the phone number stored in CRM is missing area or country codes. Our optimized search algorithm means that millions of records can be search in seconds. this means the inbound screen pop is fast, even if you have millions of records to search. Outcome rating for Gamification allows you to put a score against each outcome and then aggregate those to feed your gamification program, or other measurement programs. We have developed a set of workflows and plugin to allow easy management of queueitems. 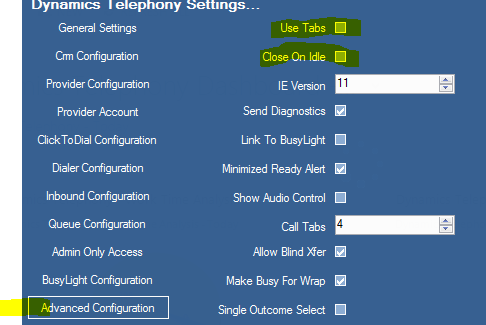 These are available through Develop Support and enable easy create, move, due date, and cancel of queue items that Dynamics Telephony queues dialer is managing. They also overcome the limitations of Quick Campaigns. The agent realtime display has been enhanced to include columns such as state, time in state, number of calls, outcomes and total these for the day. It also adds formulas to create columns like: number of calls per hour. API Enhancements enable even more solutions like populating fields in your phonecall records such as Call Result and Attempt Number. A new system option to add a link to a call recording to the phonecall record. This link allows playback of the call recording from your own call recording system. furthermore, we can copy recent recordings to CRM for anyone to playback – e.g. salespeople on the road. Uses the Chrome browser engine for increased performance and a more responsive user interface. Popped out windows are all telephony enabled. New Busylight is a physical lamp that shows the agent status. See here. New Report an Issue feature gives users an easy way to send screenshot and logs for a CRM or DT issue to support. See here. Enhanced Phonebook with your contacts and 7 days of Call History. See here. New General Setting: “Internal Phonecalls” – determines if a phonecall activity is automatically created by DT for an internal call. New General Setting: “Daylight Saving Adjust” controls whether DST is taken into account on datetimes that DT writes to CRM. Adjust this depending on whether DST is enabled on your CRM server. DT now takes into account the users and the server’s timezone when writing datetimes to CRM. You need this version if your datetimes are incorrect. For example, in phonecall start and end times. For this feature to work best, you need Crm Configuration setting “Impersonate User” ON, and to specify the Organization Uri in Crm Configuration. The Call History is now retained for 7 days. The Call History is stored in CRM so that agents see in no matter where they use DT.